In our commitment to help you safely take care of your skin, we’re presenting this list of the best body butters for dry skin after more than 19 hours of hard work and intense research. The products that made it into our list have been picked based on ther ability to provide optimum moisturization, additional skin benefits and vaue for money. Infused with argan oil coming straight from Morocco, LT Organics Natural Whipped Argan Oil Body Butter is free from parabens and sulfate. It's able to penetrate the skin deeply so you get protection from cracking and extreme skin dryness. Packed with a handful of nourishing ingredients, Tree Hut Shea Body Butter, Almond & Honey has a sweet scent that lasts all day. It promises to help your skin retain moisture better so you can avoid the discomforts of having dry and flaky skin. 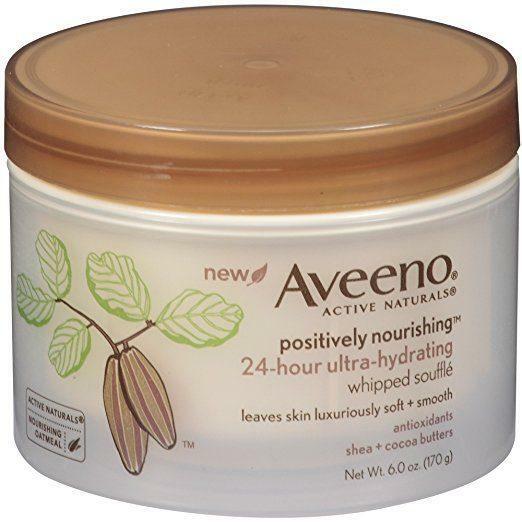 Aveeno Positively Nourishing Whipped Souffle Body Cream has oatmeal, shea and cocoa butters. It has a great moisture retention property so you get nourished skin for several hours. The Body Shop Shea Body Butter comes in a very handy size for travelers. It's 1.69 ounce jar is filled with the benefits of shea and cocoa butter. It promises to moisturize, condition and smoothen dry skin. Containing organic ingredient, Molivera Organics Raw African Ivory Shea Butter can soothe, moisturize and protect dry skin without any harsh chemicals. It comes in a big jar and offers a great nourisihing benefits you'll find it hard to resist. LT Organics Natural Whipped Argan Oil Body Butter is smooth and creamy that you might even think it’s yummy. It can deeply penetrate the skin without making you feel tacky or greasy. The nice thing about this product is that its argan oil comes directly from Morocco. Argan oil happens to be one of the best ingredients when it comes to dry skin. For one, it contains st﻿﻿﻿﻿erolin which boosts skin metabolism and helps your skin retain moisture. Apart from that, it’s also packed with anti-oxidants to protect your skin against free radical damage and premature aging. Aside from the argan oil, this body butter also has aloe, beeswax and rosehip oil. The combination of these ingredients make the product intensely hydrating, especially for those dry and cracked skin. Tree Hut Shea Body Butter, Almond & Honey has a thick consistency to seal in moisture in your skin and leave it soft and rejuvenated. You can use the product on practically any part of your skin that needs extra care, like your elbows, knees and even the soles of your feet. Aside from the organic shea butter it contains, you can also find sweet almond oil and honey in it to attract moisture. To address your flaky and cracked skin, this body butter utilizes the benefits of safflower seed oil to provide relief. It is scented and it tends to last all day long. The fragrance isn’t that bothering but if you aren’t comfortable wearing a sweet scent, this might not be the product for you. Loaded with oatmeal, shea and cocoa butters, Aveeno Positively Nourishing Whipped Souffle Body Cream promises to soothe your dry skin and make it soft. It’s also loaded with anti-oxidants to pamper your skin and make it look a lot healthier. The product is creamy and gets absorbed right into the skin. It’s not greasy or waxy and smells really nice. The moisture retention of the cream is nice, too. It will keep your skin hydrated and moisturized until the next morning or even your next shower. And for its price, this one is really budget-friendly. It contains a generous amount of product as well. Take note that this cream is scented. Although soothing and not overpowering, it can stil be a deal breaker, especially if you have sensitive nose. The Body Shop Shea Body Butter gets readily absorbed by the skin as it melts as soon as applied. It is packed with shea butter and cocoa butter to provide your skin with great antioxidant benefits. The product promises to condition dry skin while making it soft and smooth. It also works to prevent moisture loss so you’ll have to worry less about your skin flaking and cracking. The body butter is scented. It smells just like peaches and it does last. It has a smooth texture that isn’t too dense. It also doesn’t leave a sticky feeling on the skin which I find really nice. The size of this one is a bit small at only 1.69 ounce. It’s a good choice if you are always on the road or like moisturizing your skin during trips. The downside, however, is that it comes in a jar container. You have to make sure you have clean hands before dipping your fingers to get some product. Molivera Organics Raw African Ivory Shea Butter contains 100% pure ivory shea butter. And being pure, it means you get to experience its full benefits- without any harmful chemicals. It comes in a large 16 oz- jar, which is the heaviest one on this list. A little goes a long way for this product so one jar can last you for a long time. Although it’s quite tempting to apply the product thickly on your skin, make sure you don’t as it can make you feel a tad greasy. One thing that concerns me about this product is its gritty texture. You may find it a bit difficult to smoothly apply the product on your skin. But, once you do, the product effectively does its job at moisturizing dry skin. You can even use it on your hair. Body Butter Vs. Lotion: Which To Pick? If this is the first time you’re hearing about this skin care item, then you’re greatly missing out. They are actually some of the best moisturizing items you can ever use on your dry skin. But, first, let’s talk about lotion. When you have dry skin, the first thing you’ll think of when it comes to moisturizing is your botte of lotion. That is understandable, as lotion is readily available. You can buy one from your local store or order one online. Lotions bind together oil and water with an emulsifier. They get instantly absorbed by the skin and provide great relief from cracking and flaking. They tend to go nicely and smoothly on the skin. However, if you are looking for long lasting benefits, then your best bet are body butters. They are thicker than your regular lotions and tend to leave a protective layer on the surface of your skin for protection and retention. They are also a great choice for those with extremely dry and damaged skin since they have long lasting emollients that provide intense healing and moisture. Because of these exact things, body butters should be applied in smaller quantity than body lotions. Half a tablespoon will typically be enough to nourish both your arms. Body butters aren’t exactly new. In fact, they have been around for several years already. A lot of people use them in DIY skin care items, such as facial creams and body moisturizers. As they gained more popularity, commercial manufacturers began marketing them as well. Cocoa butter is one of the most popular body butters. You can find it in certain lip balms, face creams and body lotions. Shea butter is another popular choice for people dealing with dry skin. It is high in vitamins F, A and E.
Apart from that, it’s also packed with essential fatty acids which means it can provide intense moisture. It also has a natural SPF for sun protection. Mango butter almost has the same consistency as shea butter. It is white in color and comes with a mildly sweet scent. This one tends to be hard at room temperature. You may need to melt it a bit prior to application. One of the best things about cupuacu butter is that it isn’t totally comedogenic. You can use it on your skin without having to worry about skin breakouts after. Apart from that, this butter has phytosterols which are intensely hydrating. You can also find loads of antioxidants in it. If your body lotion has been unsuccessfu in providing your dry skin the nourishment and moisture it needs, then your next best option is body butter. They offer more intense hydration and long lasting benefits. For this roundup, we are selecting LT Organics Natural Whipped Argan Oil Body Butter as the best body butter for dry skin. We liked that it’s free from parabens and sufates. Apart from the goodness of argan oil, this product also has aloe, beeswax and rosehip oil to banish skin dryness for good.